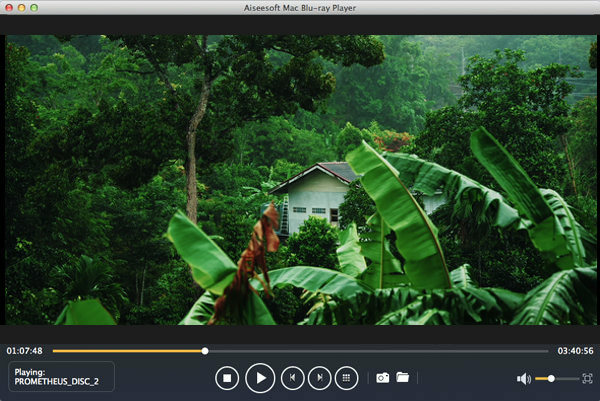 Aiseesoft Mac Blu-ray Player is used to play Blu-ray disc, Blu-ray folder and Blu-ray ISO image files with high qualified image and sound. And users can freely choose the specific Blu-ray title/chapter to play. Moreover, users can enjoy any video/audio files on this player, such as MPG, MPEG, VOB, MP4, RMVB, MKV, AVI, FLV, SWF, MOD, TOD, AAC, AC3, MP3, OGG, WAV, WMA and so on. Adopting the most advanced technology, this player can not only play Blu-ray disc, but also can play Blu-ray folder and Blu-ray ISO image files at high quality. This Mac Blu-ray Player is capable of playing all popular video/audio files, like MPG, MPEG, VOB, MP4, RMVB, MKV, AVI, FLV, SWF, MOD, TOD, AAC, AC3, MP3, OGG, WAV, WMA, etc. This software can bring a big audio-visual feast to users. With it, it is never a dream to enjoy the amazing 1080P video at home. It now can also play 4K video with best quality. The image presented by this player is in high quality and its smooth playing can also amaze users. The intuitive interface simplifies its operation, so users can enjoy the latest movies on Mac freely and easily.